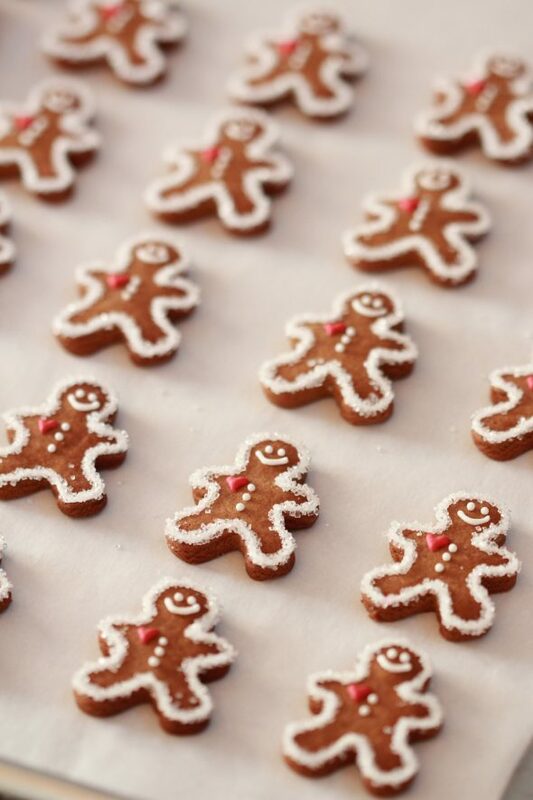 Silly and sweet gingerbread men grins atop maple syrupy goodness… I couldn’t resist sharing with you this early Holiday treat. 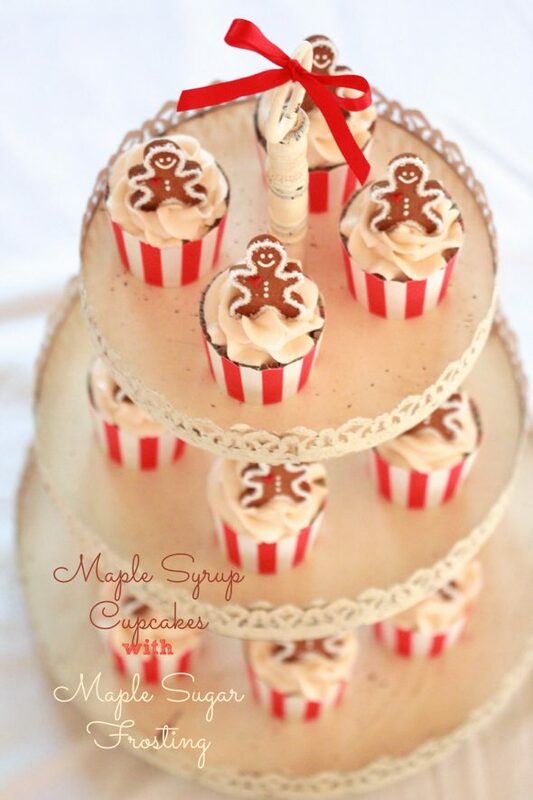 If you’re looking for a unique and delicious cupcake recipe, these maple syrup cupcakes topped with maple sugar frosting are perfect for Christmas (or any time!). 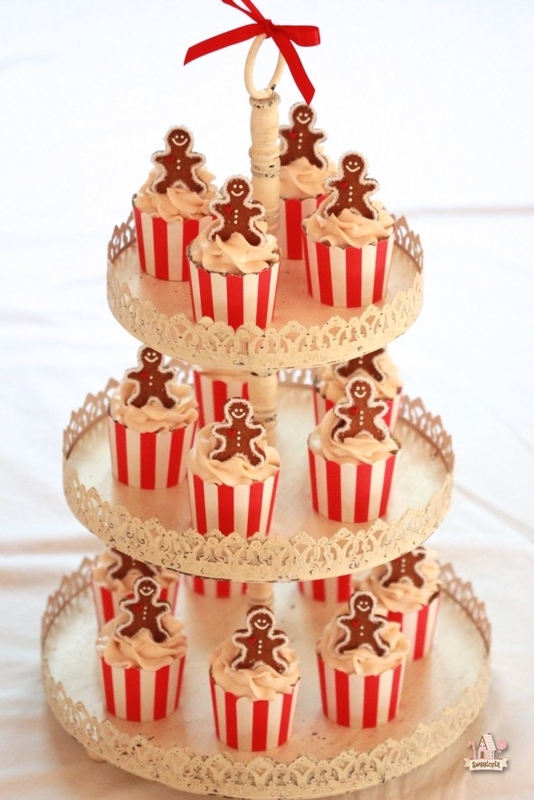 Dressed up with gingerbread cookie men or casually frosted – no matter how you serve them, they’re definite crowd pleasers. For the gingerbread men cookies, you can find the gingerbread cookie recipe here, and the icing recipe here. Cream butter for about 3 minutes, scraping down sides of bowl occasionally. Gradually add brown sugar, creaming after each addition. Set mixture aside. Add to the creamed mixture in thirds, beating thoroughly after each addition. Blend milk and maple syrup together. Beating only until smooth after each addition, alternately add the dry ingredients and liquids to the creamed mixture. Beat only until smooth and fill cupcake liners using an ice cream scoop. Bake for approximately 15 minutes or until a toothpick comes out clean. The cupcake liners are from The TomKat Studio’s shop. Check them out here. *If maple sugar is only available in solid form, grate using a fine grater, before using. 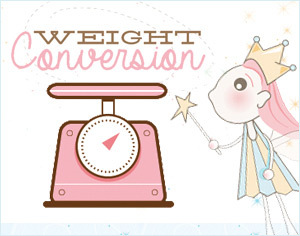 Combine all ingredients in a medium saucepan, and stir over low heat until sugar is dissolved. Put candy thermometer in place and continue cooking without stirring. During cooking wash, sugar crystals from sides of pan with a pastry brush dipped in water. Cook until mixture reaches 238 degrees Fahrenheit. Remove pan to cooling rack and cool to lukewarm (about 110 degrees Fahrenheit), without stirring or moving the pan. Beat vigorously with a wooden spoon or electric mixer until mixture begins to lose its gloss and is of spreading consistency. Ice cupcakes. If frosting becomes too thick, beat in a few drops of cream or milk. p.s. If you like using Instagram, I’ll be posting a giveaway for $100 worth of cookie cutters from Cheap Cookie Cutters there soon… a little pre-holiday fun! Hello Marian! Your Cupcakes look soooo delicious and cute! Love them! But what is ‘maple sugar’? I don’t think we can get that in our local supermarkets. Can I substitute it with something? Our local farmer’s market has it. Maple sugar is sugar produced by evaporating the sap of certain maple trees, especially the sugar maple. If you can’t find it, brown sugar works too! Thanks Marian! I’ll use brown sugar then. Hi Marian! I love everything about these – adorable! Thanks for sharing them with us! Where did you purchase your cupcake liners? Thanks!! how cute and for sure sweet…love it! These are adorable! So going to make these. I have the same cupcake wrappers and was wondering did you directly bake in these or did you bake it another cupcake liner and then slip it in this pretty holder? Still got to use mine. 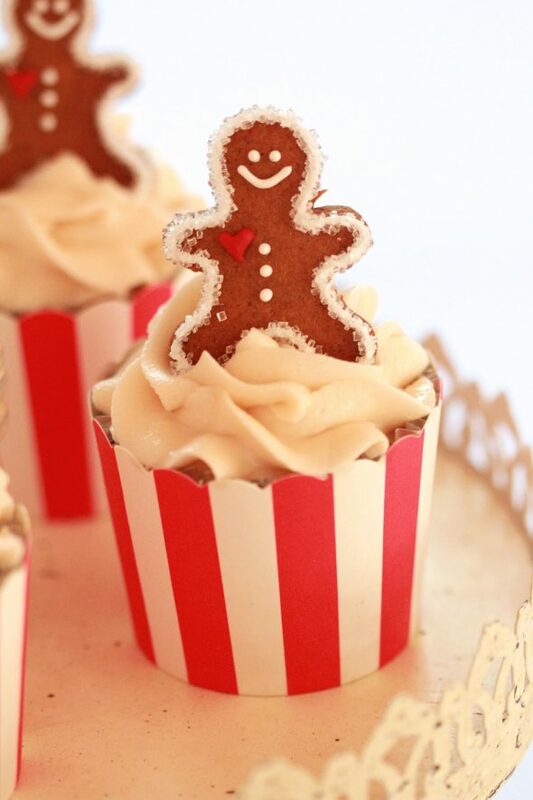 These cupcakes look adorable — and more importantly, delicious! I love maple syrup and am looking forward to trying these. And now I have an excuse to pick up some maple sugar from our spice store! Yum! Thanks for the inspiration, Marian. 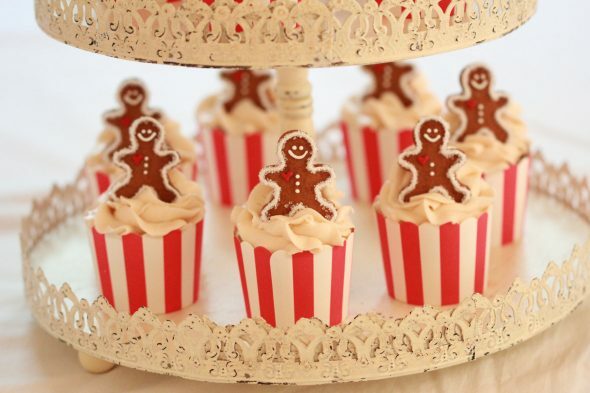 These are adorable, and sound so yummy! I love your cupcake stand, where did you get it? Love these! 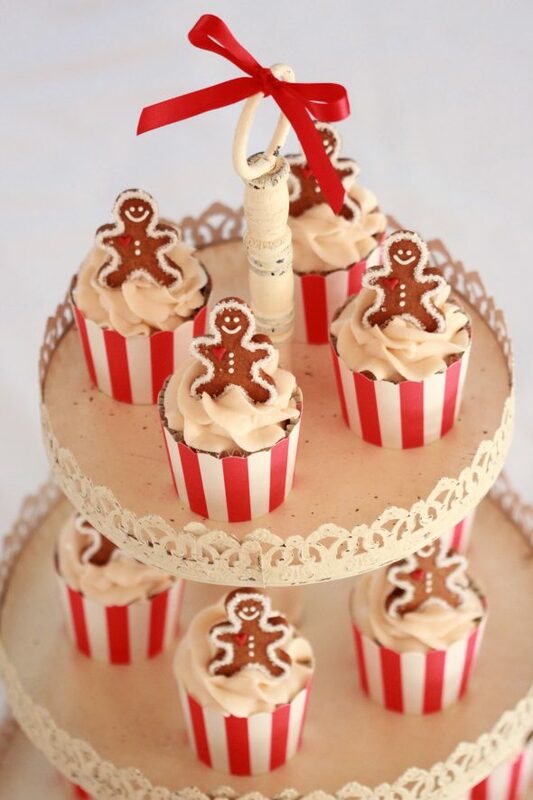 Perfect holiday treat! Thanks Marian for your reply! Have a great day!! These put me in such a happy festive mood! Beautiful! these are so cute!! I can’t wait to make fun stuff like this. How big are the gingerbread cookies? I have a set but the smallest one is 3″ high by 2.25″ wide. Love this idea! He’s about 2 inches high, Nancy. Marian, these might be my favourite cupcakes ever! I have gingerbread dough in the freezer right now. 😉 Can’t wait to try them! Hi, I tried to make these cupcakes twice. The cupcakes came out fine, but the frosting never turned out. I used a candy thermometer to get it to the right temp. When I went to beat it, it never got to a spreading consistency. In fact, when I made it the second time it became so difficult to beat that it burned out the motor on my hand mixer. Do you have any idea where I went wrong? I’m not sure what the variable is… Hmm. Either it cooled so quickly before it was mixed? Or… ? I’m so sorry your hand mixer motor burned out! Maybe try in a KitchenAid mixer if you have one?